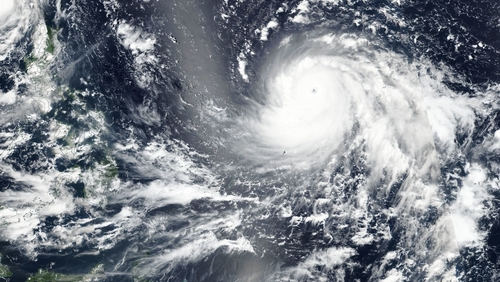 A super typhoon is heading towards the Philippines, packing fierce winds and heavy rains that are expected to strike the disaster-prone nation at the weekend before moving on to China. Typhoon Mangkhut, which has already blasted through the Northern Mariana Islands, is speeding across the Pacific with winds that can gust as high as 255km/h. Authorities said some ten million people in the Philippines are in the storm's path, not including millions more in heavily-populated coastal China. The state weather service said Mangkhut will be the strongest typhoon so far this year, with sustained winds of 205km/h. Hong Kong is also in Mangkhut's sights and preparations there were already under way, though the storm was not expected to hit until Sunday. The Philippines state weather service said heavy rains and strong winds are expected from tomorrow over the north and centre of Luzon, along with rough seas on the coasts. Storm surges of up to 23ft are expected to hit coastal areas, it said, while heavy rains could trigger landslides and flash floods.